U.S. Rep. Denny Rehberg, R-Mont. 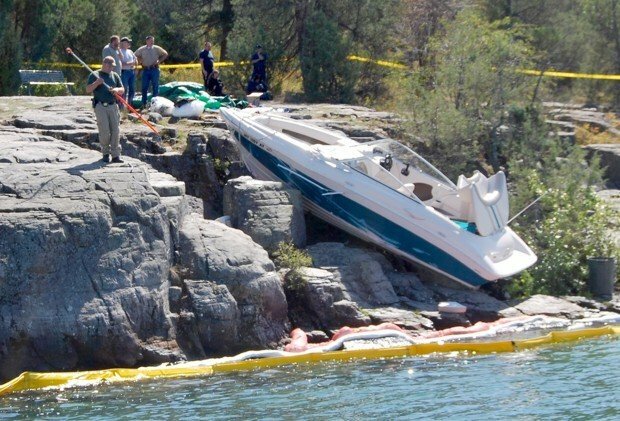 BIGFORK - A powerboat carrying U.S. Rep. Denny Rehberg, R-Mont., crashed virtually head-on into the rocky Flathead Lake shoreline at Wayfarers State Park here late Thursday night, injuring the congressman and four other people, including two members of his staff. State Senate Majority Whip Greg Barkus, R-Kalispell, was behind the wheel when the accident occurred between 10 p.m. and 11 p.m., officials said. A boat matching the description of the one in the accident is registered to Barkus' wife, Kathy, according to the state Justice Department. Rehberg underwent surgery Friday afternoon for a broken left ankle, and also suffered cuts, bruised ribs and "quite a bump to the head," according to his former chief of staff, Erik Iverson, but was "alert and engaged." 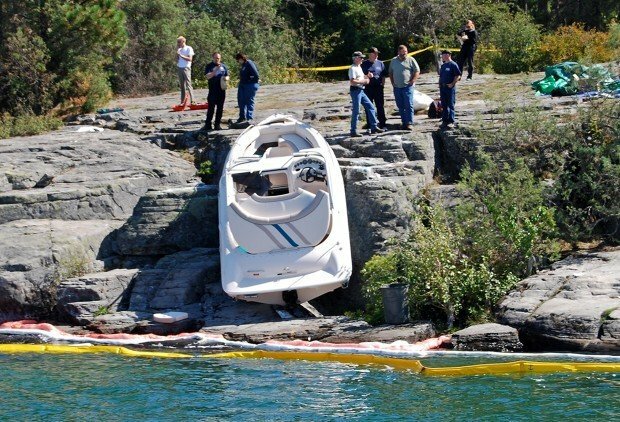 Iverson said he did not know if Rehberg or any of the other passengers had been ejected from the 21-foot powerboat when it hit the rocks at a speed great enough to propel it completely out of the water and leave it sitting at a 45-degree angle on the steep shoreline. Iverson visited Rehberg at Kalispell Regional Medical Center around noon Friday, just before the congressman was taken into surgery. Rehberg's wife Jan, who was en route to Kalispell from Billings, asked Iverson to make a statement and answer questions from the media in a conference call Friday afternoon. The meeting was brief, said Iverson, a longtime friend of the Rehberg family. "He cracked a joke, said I'd probably never seen him looking better," Iverson said, adding that Rehberg never lost consciousness. "His primary concern is with the other people in the boat." Also on board, in addition to Greg and Kathy Barkus, were Rehberg's state director Dustin Frost and deputy chief of staff Kristen Smith. Hospital spokesman Jim Oliverson said he'd talked with Greg Barkus and that "he feels terrible, obviously." At least one unidentified passenger was airlifted to Kalispell from the park. Iverson said Rehberg was transported by ambulance. All, including Rehberg, were listed in stable condition Friday afternoon, according to Oliverson. Campers at Wayfarers heard the late-night crash, went to investigate and called 9-1-1. Bigfork Fire and Ambulance responded, and the Alert helicopter from Kalispell set down near the campground host's site. Campers and boaters were being turned away after officials closed the state park and its campground Friday morning to facilitate the accident investigation, although people who had already paid to camp there were allowed to remain. Two of the campers who left Friday afternoon after making statements said authorities told them not to discuss anything they had seen at the accident site. Mike Dennison, a Missoulian State Bureau reporter who is on vacation in Bigfork and was boating in the same area Thursday evening, said there was little boat traffic, a light breeze, and the lake was calm at about 10 p.m.
Wayfarers is a 69-acre state park at the northeast end of Flathead Lake. Its several hundred feet of undeveloped shoreline give boaters no lights to follow in the area where the crash occurred. Jim Satterfield, regional director of Montana Fish, Wildlife and Parks, said the boat and crash site would be subjected to a "standard investigation." Authorities will look at the condition of the boat, try to determine its speed, investigate whether alcohol or drugs were involved and whether anyone was wearing lifejackets. Asked if Rehberg had said whether anyone on the boat had been drinking, Iverson said: "He didn't, and I can't say for certain one way or another. The congressman was a passenger on the boat, he was not driving. The investigation is ongoing, and I'm sure details will be forthcoming." Rehberg had toured a new Confederated Salish and Kootenai tribal health building being constructed in Polson earlier Thursday. Scheduled town hall meetings with the congressman in Cut Bank and Shelby Friday were canceled, and Rehberg's schedule has been put on hold, according to Iverson. Iverson said Rehberg's recovery time from the surgery is expected to be "significant." Satterfield said Wayfarers Park will not reopen until the FWP, the Montana Highway Patrol and Flathead County Sheriff's Office complete the investigation. Meanwhile, friends and relatives of the crash victims continued to arrive at the hospital Friday afternoon. In addition to the congressman's wife, Rehberg's father was also en route from Billings, and Iverson said that family members of the other victims were either at the hospital or on their way. State Sen. Gary Perry, R-Manhattan, a good friend of Barkus, told the Associated Press Friday morning that he had just heard about the crash and was on his way to the hospital - which, Oliverson said, has "had tons of calls from all over the nation." Perry said he knew little about Barkus' condition. "It's a tragic accident," Perry said. "We're praying for him." Likewise, state Sen. John Brueggeman, R-Polson, said that "we're just kind of in shock right now." "We're keeping our fingers crossed," said Brueggeman, who said he's close friends with both lawmakers, as well as members of Rehberg's staff. "Obviously Denny and Greg and everyone on the boat, they're all in our thoughts and prayers. We're hoping for the best for everyone." "We will pray for you to be healthy and stay safe! Thank God you are alive!!!" "I am praying that all injuries are minor and that all will soon be recovered. God bless!!" "I'm sorry to hear about your accident; our thoughts and prayers are with you." Iverson stressed repeatedly in the conference call that Rehberg is doing well. He has cuts and bruises on his face, Iverson said, and "he's obviously pretty tired and pretty sore, but he's definitely the same guy. He was asking questions, making jokes and complaining that the batteries in his Blackberry are running down." Missoulian State Bureau reporter Jennifer McKee and Billings Gazette reporter Tom Lutey contributed to this story.